This article was originally written in 8 July 2014 and has been updated to reflect the latest changes. Answer: Yes, the CPF Life Basic plan appears to be more superior. The Internal Rate of Return or IRR is a measurable of how good or bad an investment is. Let's say the IRR of X is 4% while the fixed deposit is 1%, it implies that X is a better deal. This assumes X and fixed deposits are identical in all aspect except for its IRR. 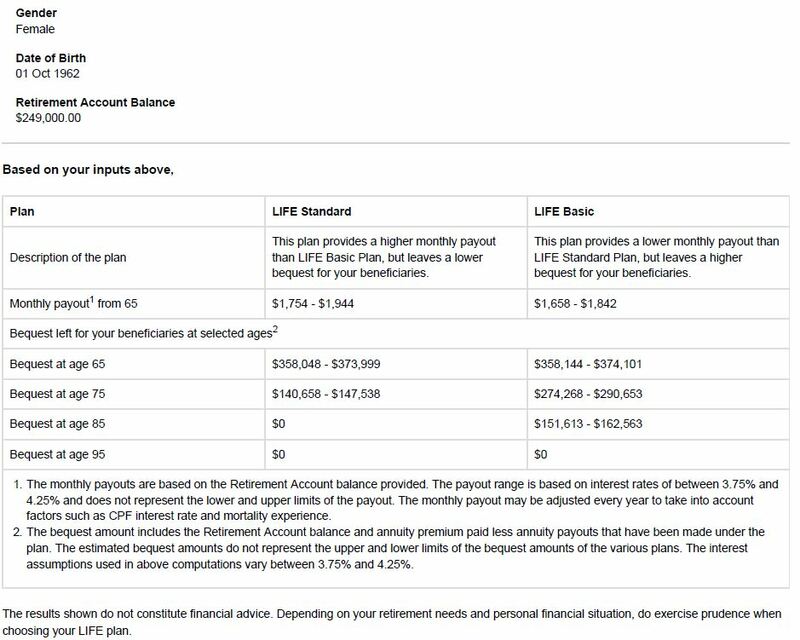 Based on the above quotation from CPF, for the CPF LIfe Standard Plan of single premium $249,000 at age 55 and payout starting at 65 for $1754 every month for 20 years (assuming dies at 85) and the bequest at the end of the payout period is $0, the internal rate of return is 2.73% per annum. As for the upper limit of the projected payout, the return is 3.29% per annum - this assumes a projected payout of $1944 and a projected bequest of $0. As for the CPF Life Basic Plan, for the single premium $249,000 at age 55 and payout starting at 65 for $1658 every month for 20 years (i.e. assuming dies at 85) and the bequest at the end of the payout period is $151,613, the internal rate of return is 3.68%per annum. As for the upper limit of the projected payout, the return is 4.17% per annum. This assumes a projected payout of $1,842 and a projected bequest of $162,563. So it can be seen that CPF Life Basic Plan is superior in terms of its IRR as compared to the CPF Life Standard Plan. Its unfortunate that there is no figures given on how much the bequest for the CPF Life Basic Plan would be between 86 to 94. Hence, it is not possible to calculate the IRR for the CPF Life Basic from 86 to 94.. What we do know is that CPF Life Basic has two portion: The 90% of the initial premium stays in the CPF-RA while 10% is invested into the annuity pool. From 65 to 90, the monthly amount will be drawn from the CPF-RA. By the time the CPF Life member reaches 90, the CPF-RA would be zero and the annuity portion starts at 90 years old onwards. Assuming a person kicks the bucket at exactly 90 years old, there is still a cash value for this annuity. The cash value is equivalent to the amount that was previously deducted (10%) but without interest. So we can assume the bequest at age 90 for CPF Life is $24,900 using the above example. So let's recalculate on what happens if the CPF Life dies at age 90. For the single premium $249,000 invested in CPF Life Standard at age 55 and payout starting at 65 for $1,754 every month for 25 years and the bequest at the end of the payout period is $0, the internal rate of return is 3.53% per annum. As for the upper limit of the projected payout, the return is 4.05% per annum assuming a projected payout of $1,944 and a projected bequest of $0. As for CPF Life Basic, for the single premium $249,000 at age 55 and payout starting at 65 for $1658 every month for 25 years and the bequest at the end of the payout period is $24,900, the internal rate of return is 3.41% per annum. As for the upper limit of the projected payout, the return is 3.91% per annum. This assumes a projected payout of $1842 and a projected bequest of $24,900. Below is a table of summary of the various returns figure assuming you opt for the CPF Life at 55 years old. It can be seen from the above that the CPF Life Basic Plan is superior if the life expectancy is 85 or below. However, the CPF Life Standard Plan is only marginally better at 90. 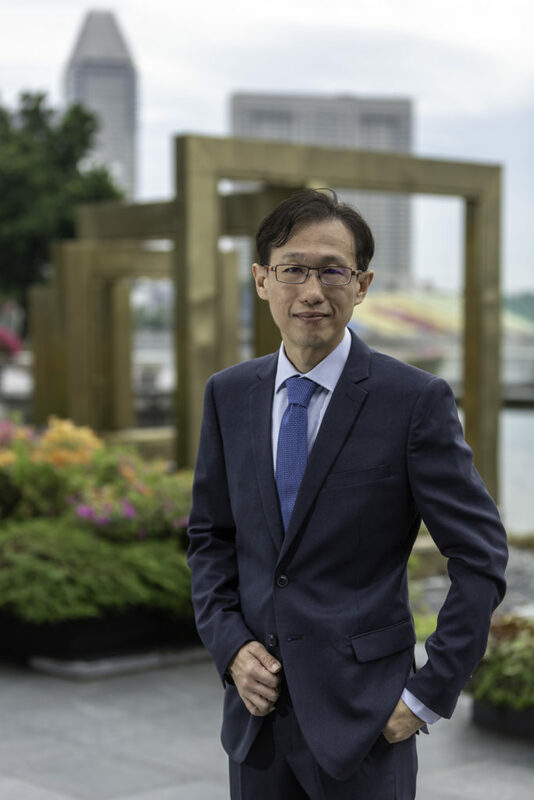 The ‘poor’ returns of CPF Life Standard is due to the fact that all of the CPF RA is being invested into the common insurance pool while only a small amount (10%) of CPF RA under CPF Life Basic goes to the insurance common pool. The seemingly poor return is due to the ‘penalty’ of early exit from the pool in order to help subsidise the remaining in the pool who live too long. This is how insurance works through risk pooling. Unfortunately, we do not know whether this risk pooling is efficient as there is no further benefit illustration available. What we do know is that the interest earned in this insurance pool is not refunded upon death. Personally, I recommend CPF Life Basic to all my clients partly because the IRR is likely to be higher than Standard Plan and also because CPF Life Basic is more transparent. For CPF Life Basic, 90% of the money is still residing in the CPF Member's CPF Retirement Account. The CPF Member can see for himself all the transactions and interests earned in that account. On the other hand, the entire CPF-RA is deducted and invested into the annuity pool under CPF Life Standard Plan. It is like a blackbox and nobody knows what's going on. I also do not know where to get the report on the financials of this annuity pool. It is important to note that the CPF Life Standard is the default plan. This means if the CPF Member do not do anything, the CPF Member will be automatically opt-ed into the worst of the two plans eventually! Of course, if the CPF Member thinks he will live beyond 90 and is not concern with transparency, the default CPF Life Standard is the better option. Want to know more about CPF Life? Can I still service my housing loan using CPF after I turn 55? Can I choose how much of my savings to use for CPF LIFE? Can I pledge my property? By entering your details below, you will also receive useful financial planning articles from me. We will email you the link as soon as possible. Download the latest 22 June 2017 Full Report on CPF Life now! 1) Assuming one lives till age 80 or so. Would Standard plan a better option than Basic plan in terms of getting the most money out? 2) The CPF LIFE is compulsory and we have no choice. 1) Nope, basic plan will be better than standard plan if die at 80. From the figures, guess the crossover advantage will be around 90 where standard will be better. Can only guess, coz no actual breakdown of figures yearly. How to choose? Flip a coin. Or see the lifespan of your parents and your siblings. At what age they die? Any family history of bad genes — cancer, diabetes, hypertension, stroke, etc etc. What is your current health status? Any chronic illness? Healthy lifestyle or every weekend pig out at buffets? If really want to control time of payout, can consider suicide. BUT NOT SURE IF SUICIDE COVERED OR NOT. Anyway I’m 100% certain euthanasia will be legal in S’pore by 2030. Standard plan gives a higher payout than Basic plan. If one dies at age 80, wouldnt he receives more money (accumulated) in Standard plan? I am getting confused now. Are you merely interested in the total monthly payouts until you die? Or in the total monthly payouts PLUS bequest? If total monthly payouts + bequest, then basic is better ….. until you survive after 90 (GUESSTIMATE) ….. after 90 standard will be better as the monthly pittance is slightly more by a pathetic $50. As you can guess, I am not of the opinion that having the joy of extra $50 monthly is worth the risk of ZERO bequest if die between 75-85. FYI, the current median life expectancy for S’pore female is about 85, i.e. half of females will mati before 85. IF you don’t care about bequest, then standard is better lah — extra $600/year. 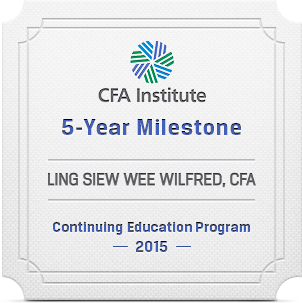 I am only interested in getting back as much my CPF money as possible. Thanks for replying to my email query. Guess we should pressurise the CPF board to give more details just like how the insurance industry is being regulated by MAS. So such CPF product is not subjected to MAS ruling as they are the ”government” ? . Why don’t you write to the forum suggesting CPF Life to be regulated under MAS and have all the disclosure similar to other annuity products sold by insurance companies? I am sorry, but what is the equation you make use of to come about with the PV? Its based on a discounted value of the future cash flow. No close ended formula used. The CPF LIFE is not beneficial because your money is taken out from your RA to buy annuity at 55 and 65. The amount taken out will not earn interest for your RA. The Standard plan is worse off than the Basic because 50% will be taken out at 55 and the rest at 65. For Basic plan, about 10% is taken at 55 and another about 10% at 65 and I noted that the figures are lower for male and higher for female. I calculated that with a sum of $155K put into the RA at age 55 and a regular payment of $1200 per month from 65, the amount in the RA can last till age 93.75 (assuming RA earns 4% interest plus an additional 1% for first $60K). Not only this, the bequest is significantly much higher than what CPF LIFE Standard plan is offering. I would have preferred my money is left in my RA for me to draw down once I reach 65 and not opt for the CPF LIFE plan. I have given my feedback to the CPF Advisory Panel to study possible enhancements to the CPF system . Members of the public who wish to provide feedback to the Panel can email their views to [email protected]. One nasty fact of any annuity is that the rich will benefit simply because they tend to live longer. The poor will end up poorer under this scheme. I think the annuity starts paying out from 65 yo and not at 90yo. The reason is because based on your 79 yo top up article, CPF did a quotation and it stated that the payout has 2 categories , AMP and CPF life. Meaning CPF life annuity already kicked in before 90yo ( in the case of your client 79 yo and before). For CPF Life Standard, the annuity starts at 65. But for CPF Life Basic, the annuity starts at 90. Between 65 to 90, its a drawndown from CPF-RA. As for the article https://www.ifa.sg/cpf-top-79-years-old/ that you are referring to, its for a CPF Member who is 79 years old and he was enrolled in CPF Life Plus Plan which is no longer available. 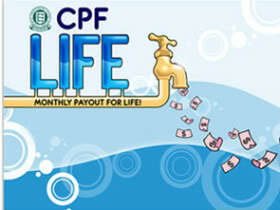 CPF Life Plus Plan was withdrawn for those who join the CPF Life scheme on and after 1 January 2013. I don’t it is wise to use solely the IRR to measure and compare the 2 plans, since the monthly payout is different. If we use the “standard” financial investment advice for pitching, we can always say we can use the extra monthly payout from the standard plan to invest, to achieve a higher IRR than the basic plan. The truth is the monthly payout is mostly used for spending for retirees, and the extra monthly payout carries an extra cost of ~1% of the total amount – in investment returns perspective, or larger bequest in the client’s perspective. Not right to SOLELY use IRR of the plan for decision making. Nothing in the article suggests the IRR is solely the reason used. Sorry, in that case you may want to amend your article, as you conclude that cpf standard is the worst of the 2 plans, base on IRR- which is not the case, as IRR is not the only sole factor to decide whether a plan is good. I noted that that you had amended your article to reflect that IRR should not be used as the sole factor in comparing the various CPF plans, (I believe) in response to my comments. Though I am anonymous, I thought it will be good to acknowledge my comments and indicate that you had amended your article. This is to show at least some acknowledgement to the commentators that had posted comments, even though I posted as an anonymous. Thank you. I didn’t amend the article at all. You didn’t read my article completely in the first place. That’s why I told you that my article didn’t say the irr is the sole reason for the decision but you choose to just focus on a few sentences. I checked my wordpress history revision and the last amendment was September 1, 2017 @ 14:23:15. This was before you made the first comment. Are you trying to cast doubt on my integrity? Are you a competitor? Considering you only use anonymous email and the manner you are trying to attack I strongly suspect you are a competitor. I’m not your competitor and I don’t think your competitors will do that. If you think what I said is wrong or inaccurate, please delete all my comments. Thanks. If i dont have any children and I only have a younger sibling, would the Standard Plan be better? Why is that so? Should I care about the money left as bequest when I’m dead and have nobody to leave it to? Shouldn’t my main concern be the amount I’m getting while alive and of course, the period?